Purchasing a new mobile phone is a complicated process, and it’s not helped by the fact that companies offer new models all the time, and service providers are always giving discounts. It’s pretty easy to make a decision based on finances alone. After all, we all want to save money nowadays. But that might not always be the right decision. Saving money can mean that you lose out heavily on features that could make a difference to you. And buying a phone that you quickly come to regret is not a real saving, as you’ll be tempted to trade it in as soon as you can. We looked at the Sony Xperia Tipo, a mid-range phone that’s offered steeply discounted by most service providers and compared it to the HTC One SV, a new offering from HTC, that runs more expensive than the Xperia. Is spending the extra cash worth it? Keep reading to find out. The One SV does a lot of things well. It’s far faster than the Xperia, running a 1200 MHz processor over the 800 MHz processor on the Sony, making it more powerful and snappier. It also runs double the RAM, making it more responsive and enabling it to better handle multi-tasking or running more than one process at a time. You also get faster maximum data speeds, meaning you get quicker downloading and faster opening of web pages. The screen is larger, 4.5 inches as opposed to 3.2 inches. Not only that, but it’s better quality to, having three and a half times higher resolution and forty per cent more PPI (pixels per inch). This makes for a display that’s noticeably brighter, more colourful and crisper than that of the Xperia. The in-built camera is also higher resolution, its 5 MP (rather than the 3.2 MP on the Sony) taking photos that are better quality and have more fine detail. You have newer Bluetooth support (the HTC runs Bluetooth 4.0, the Xperia 2.1), which means you get faster data transfer and that your phone uses less battery when connecting to Bluetooth devices such as hands free sets. You also get more internal storage, the HTC has 8 GB of memory, the Sony only 2.9 GB. That means you can store more music, photos, data and games on your device. 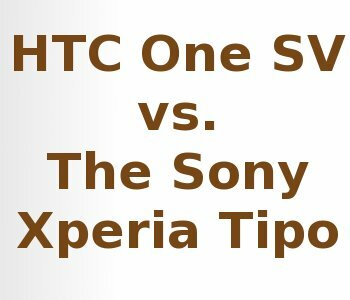 Finally, the One SV is also around thirty per cent thinner than the Sony. A pretty great package. Not a lot really, despite running the same Android 4.0 Ice Cream Sandwich operating system. It is a little smaller and around twenty per cent lighter than the HTC, but it does have a far smaller screen, which is probably why. Definitely – The savings you make on the Sony Xperia Tipo just don’t make up for the huge loss in functionality that you get in return. The HTC is faster, has a better screen, a better camera and more internal memory. Sometime you get what you pay for, and the HTC One SV is definitely a phone that you won’t come to regret, and is more than worth its price. Phil Turner likes the idea of a free text and calls contract, but his current phone usage would not justify moving from PAYG.